When you have an amazing team – Magic Happens!! That was so the truth on this fun, summer shoot with the best wedding vendors in Dallas! So how does a styled shoot come together?? First, I received a call from Jodi Washington with Double You Photography. Let me tell you about Jodi! I was a little nervous, because she’s super talented (of course I had stalked her on social media!) and she’d already been featured in well known publications. But this lady is so fun and down-to-Earth! (Now we’re great friends and crack up everytime we’re together!) 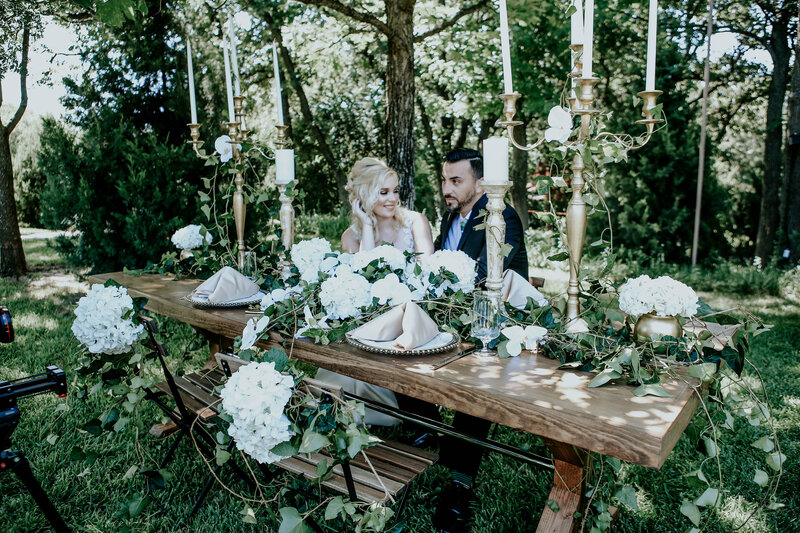 Jodi had a vision of an elopement in a beautiful green forest with lots of love and ivy! She said, “I want this couple to look like they just found an open meadow and got married.” Sooooo……. The search for the perfect venue was on! it didn’t take long to find A & M Gardens in Azele. A & M Gardens have lush and beautiful gardens (hello – its right there in the name!). Jodi had 2 gorgeous models (Katie and Prynce) already booked and they totally rocked it! The very talented Natalia with Natalia Issa Hair and Makeup made the duo look even more stunning (if that’s even possible – because I mean… wowzer). Katie wore a killer dress from The Blushing Bride Boutique who always have the most exquisite dresses and accessories. Next we needed, Florals, Stationery, Cake, and Rentals! This is where finding the perfect team comes together. Jodi and I have both worked with Maribel with Bella Fleur Designs and knew she would knock the florals out of the park. Yvette with Simply Mox came up with an amazing design for the invites and menu cards. Stephen’s Sweet Sensations made a delicious and beautiful cake (he even found ivy inspired cake servers!!). My favorite rental company is Beautiful Event Rentals because Cammie has such an amazing eye and is so easy to work with (and I want all of her rentals inside my home!!). We also worked with AM Linen Rentals for the napkins (but I go to them for EVERY linen need!). The shoot took place in in the summer in Texas….so we were melting…but you would never have guessed it because we were laughing and having so much fun. And that’s how you make magic!!! Head over to Double You Photography’s facebook page to see the behind the scenes video from Washington Filmz. We also were featured on 7 Centerpieces here.